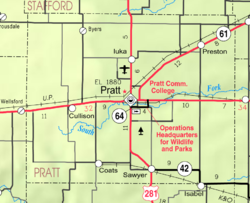 Pratt was founded in 1884 and named after Caleb S. Pratt, a young Civil War officer from the Kansas Infantry, who was killed in the Battle of Wilson's Creek near Springfield, Missouri The first post office in Pratt was established in June 1884. In 1887, the Chicago, Kansas and Nebraska Railway built a main line from Herington to Pratt. In 1888, this line was extended to Liberal. Later, it was extended to Tucumcari, New Mexico and El Paso, Texas. It foreclosed in 1891 and was taken over by Chicago, Rock Island and Pacific Railway, which shut down in 1980 and reorganized as Oklahoma, Kansas and Texas Railroad, which merged in 1988 with Missouri Pacific Railroad. In 1997, Missouri Pacific merged with Union Pacific. Most locals still refer to this railroad as the "Rock Island". Built in 1930, Hotel Roberts is the largest and most highly styled historic hotel in Pratt. Construction of the hotel was initiated by the Pratt Chamber of Commerce, which formed a committee in the late 1920s specifically to facilitate the construction of a large new hotel. Seen as a potentially valuable asset for the community, the hotel was financed in part through a public subscription campaign, and constructed on land provided by the Chamber. The Pratt Hotel Company owned and operated the hotel and hired Wichita architect Samuel S. Voigt and Kansas City contractor Webster L. Elson to design and build the building. Elson not only supervised the rapid construction of the "fire-proof" building, he was a founding member of the Pratt Hotel Company, and he retained an ownership interest in the property for many years. The community hospital was established on the eighth floor of the building in 1932, complete with an operating room and an x-ray machine. Architecturally, the building is significant as an early and sophisticated example of the Art Deco style in central Kansas. The hotel opened as the Hotel Roberts in 1930, and continued under that name until 1959, when it was purchased by Monte Parrish and renamed the Hotel Parrish. In January 2015 it was listed on the National and State Registers of Historic Places for its local significance in the areas of architecture and community planning and development. The nearby Pratt Army Airfield Base served as the final staging area for B-29 outfitting in 1943-1945. The Miss Kansas Parade and Pageant are held here. The state headquarters of Kansas Department of Wildlife and Parks was constructed southeast of the town. According to the United States Census Bureau, the city has a total area of 7.49 square miles (19.40 km2), of which 7.37 square miles (19.09 km2) is land and 0.12 square miles (0.31 km2) is water. Pratt is located approximately eighty miles west of Wichita. As of the census of 2010, there were 6,835 people, 2,837 households, and 1,713 families residing in the city. The population density was 927.4 inhabitants per square mile (358.1/km2). There were 3,201 housing units at an average density of 434.3 per square mile (167.7/km2). The racial makeup of the city was 93.3% White, 1.5% African American, 0.6% Native American, 0.4% Asian, 2.3% from other races, and 2.0% from two or more races. Hispanic or Latino of any race were 6.2% of the population. There were 2,837 households of which 27.7% had children under the age of 18 living with them, 46.4% were married couples living together, 10.2% had a female householder with no husband present, 3.8% had a male householder with no wife present, and 39.6% were non-families. 34.4% of all households were made up of individuals and 16.7% had someone living alone who was 65 years of age or older. The average household size was 2.28 and the average family size was 2.93. The median age in the city was 39 years. 22.4% of residents were under the age of 18; 12% were between the ages of 18 and 24; 21% were from 25 to 44; 25.2% were from 45 to 64; and 19.5% were 65 years of age or older. The gender makeup of the city was 48.8% male and 51.2% female. As of the census of 2000, there were 6,570 people, 2,839 households, and 1,780 families residing in the city. The population density was 886.0 people per square mile (341.9/km²). There were 3,312 housing units at an average density of 446.6 per square mile (172.3/km²). The racial makeup of the city was 94.87% White, 1.00% African American, 0.38% Native American, 0.64% Asian, 0.03% Pacific Islander, 1.95% from other races, and 1.13% from two or more races. Hispanic or Latino of any race were 3.46% of the population. There were 2,839 households out of which 29.3% had children under the age of 18 living with them, 51.3% were married couples living together, 8.9% had a female householder with no husband present, and 37.3% were non-families. 34.1% of all households were made up of individuals and 16.4% had someone living alone who was 65 years of age or older. The average household size was 2.26 and the average family size was 2.91. In the city, the population was spread out with 24.3% under the age of 18, 8.4% from 18 to 24, 24.3% from 25 to 44, 22.0% from 45 to 64, and 20.9% who were 65 years of age or older. The median age was 41 years. For every 100 females, there were 89.9 males. For every 100 females age 18 and over, there were 84.7 males. The median income for a household in the city was $33,646, and the median income for a family was $42,412. Males had a median income of $31,186 versus $20,640 for females. The per capita income for the city was $17,486. About 7.1% of families and 10.3% of the population were below the poverty line, including 12.8% of those under age 18 and 10.2% of those age 65 or over. Bus service is provided daily eastward towards Wichita, Kansas and westward towards Pueblo, Colorado by BeeLine Express (subcontractor of Greyhound Lines). Theodore Bagwell lies low in a Pratt bar in "The Killing Box", an episode of the television series Prison Break. In Stephen King's "The Stand", Nick Andros and Tom Cullen meet the promiscuous, ultimately vicious Julie Lawry at Pratt. 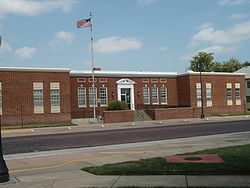 ^ "Kansas Post Offices, 1828-1961". Kansas Historical Society. Archived from the original on 9 October 2013. Retrieved 22 June 2014. ^ "Pratt County, National and State Registers of Historic Places". Kansas Historical Society. Retrieved 12 February 2015. Wikimedia Commons has media related to Pratt, Kansas. This page was last edited on 24 March 2019, at 15:21 (UTC).